In April I’ll be heading to Detroit to participate in the LaFargeHolcim Forum on “Infrastructure Space.” I’m really grateful to have been invited to take part — and to share a few days of talks and tours with lots of great people. The workshop to which I’ll be contributing focuses on the city scale of analysis; we’ve been asked to address the issue of infrastructural invisibility, the challenges of infrastructural representation, how our understanding of infrastructures impacts the ways we conceive of scale and the limits of the “urban,” and how infrastructure can foster the development of new communities, economies, and forms of collectivity. Abstract: I begin this paper by describing the growth of interdisciplinary interest in infrastructure and the methodologies and pedagogies employed to cultivate infrastructural “literacy” and intelligence. The proposed consequences and benefits of this intelligence, I explain, include the engagement and emancipation of diverse urban publics, who, armed with new technical knowledge, are potentially empowered to advocate for more just and accessible services, or even construct their own alternative infrastructures. I then examine the urban institutions that both cultivate and collect this infrastructural intelligence; public libraries in particular play a critical role in establishing an urban infrastructural and intellectual commons. I close by proposing how libraries, as part of a larger urban network of knowledge infrastructures, can provide structures and communities of learning, and cultivate forms of intelligence – experiential, dynamic, practice-based – that are uniquely well suited to grappling with our complex, over-determined urban systems. These days it might seem that everything is infrastructure because infrastructure seems to be everywhere – on the agenda in a tremendous variety of fields of professional and creative practice and scholarly inquiry. Data visualizers and hip hop artists, literary scholars and medievalists, playwrights and film critics, management consultants and anthropologists have entered what has traditionally been the domain of civil engineers, city and federal governments, and global investment firms. And their conceptions of infrastructure have expanded to include everything from bridges and pipelines to technical protocols and social services and aesthetic forms. We might attribute this growth of infrastructural “awareness” and allusion to a number of recent technological and cultural shifts: a sudden recognition that the Internet is a place made of countless material things – cables and data centers and rare earth minerals – along with lots of intellectual and political constructs, too; a dawning realization that our Amazonian consumptive appetites are dependent on similarly heavy logistical systems and exploitative labor practices; and a surrender to the reality of the Anthropocene and its precarious infrastructural, environmental, political, and ethical futures. This emergent infrastructural intelligence has spawned an explosion of infrastructural “literacy” and engagement projects that seek to “make visible the invisible,” to call out the unrecognized, to bore into the “black-boxed.” Grand Tours of nuclear infrastructures and key sites in telecom history have inspired many a recent Bildungsroman, in myriad mediated forms. Apps and data visualizations, soundwalks and speculative design workshops, DIY manuals and field guides, urban dashboards and participatory mappings, hackathons and infrastructural tourism – strategies employed by artists and activists and even some city governments and federal agencies – all seek to “raise awareness” among a broader public about infrastructure’s existence and its politics. They aim, further, to motivate non-specialist communities to contribute to infrastructure’s maintenance and improvement, to inspire citizen-consumers to advocate for more accessible and justly distributed resources, and perhaps even to “engineer” their own DIY networks. The underlying assumption in many cases is that by making infrastructures visible or otherwise sense-able or experiential, those systems thereby become sensible, comprehensible – and perhaps even manipulable and hackable. Sensation translates into cognition, engagement, a sense of “ownership,” and, most ambitiously, technical competence and “emancipation.” De-obfuscating what Benjamin Bratton calls the “black stack” – that “opaque and unmappable,” overdetermined and inevitable assemblage of hardware, software, protocols, interfaces, urban topographies, and social formations that constitutes our infrastructures – has the potential to generate what Tiziana Terranova terms the “red stack.” This reappropriated stack is made by “hijacking” official and commercial technologies, constructing “new platforms through a crafty bricolage of existing technologies,” and enacting “new subjectivities through a détournement” of standard literacies. These new techno-social practices and systems – these rogue infrastructures – promise to generate new forms of collectivity and emancipatory political economies. Yet these “red” infrastructures need not necessarily be opposed to official systems. Designers and developers have for years sought to glean insight from shadow economies and informal urbanism, from slums and favelas, hackers and pirates. Our newly enlightened and activated “red” collectives can potentially generate a form of infrastructural intelligence – ethnographic, grassroots – that offers an alternative, or a supplement, to “official” information sources and automatically-generated, sensor-harvested data. The intellectual products of our infrastructurally enlightened, emancipated, engaged publics offer an epistemological complement to the intelligence coded into and harvested by our “smart” infrastructures. This co-optation of the rogue might, and perhaps should, concern us, because it suggests the futility of resistance and autonomy. Or perhaps instead it represents a productive and empowering enlistment of infrastructure’s diverse, even marginal, publics – all those who constitute the consumer bases or commons it serves – in its design, activation, and evolution. Yet I think the heavy-handed symbolism of this color-coding – which is itself yet another means of representing infrastructural politics, of rendering it sense-able and thereby sensible – is itself rather obfuscatory. The “official” isn’t always black – opaque and oppressive – and the hacktivist and grassroots isn’t always a consciously revolutionary red, or a productive act of resistance. While the promotion of infrastructural intelligence and technical skills among infrastructure’s publics can cultivate invaluable literacies and forms of citizen engagement, the “build-your-own” approach and its DIY ideology have limitations. There are some cases, I’d say, in which the greatest good comes when we (and we could debate the scale at which that “we” should be conceived) are “in it together,” all committed to an infrastructural commons, all dedicated to the creation of inclusive and accessible and just systems and services that benefit from our collective intelligences and serve our collective needs. …underscore the great and unbridgeable difference between a phone booth fitted out with books and cushions and potted plants, on the one hand, and on the other, a fully functional and sustainable public library system, with the infrastructure and expertise to serve the diverse publics of a great [city or] nation. 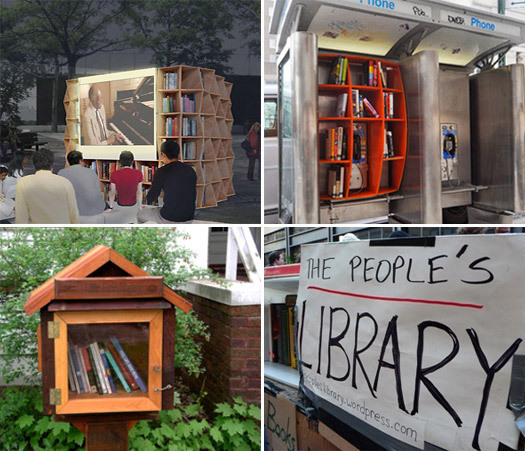 The little library movement is enabling us… to appreciate the distance that separates these ephemeral, marginal spaces and projects from the strong, stable public institutions that have been so central to our cities, and to our democracy. Yet, ultimately, I advocate for the commons writ large. I propose that our best course of action would be to blend formal and informal intelligences – to determine “how these ever more prevalent “provisional, opportunistic and guerilla” projects can complement and strengthen our more traditional institutions and the cities they serve. Sure, we can let a thousand flowers – or home-grown infrastructures – bloom, but if we want them to cross-pollinate, and became robust and resilient through their genetic hybridization, we need to make sure they’re growing in the same garden, or that we develop effective and reliable means of exchange – of resources, knowledge, practices, and so forth. Our libraries demonstrate that infrastructures are simultaneously technical, architectural, social, epistemological, and ethical (I wrote about this a little while ago, too). They show how techno-spatial structures embody politics and values. They give us an opportunity, if we want it, to build systems and spaces that represent the ideals and social responsibilities that are central to our civic identities and subjectivities as democratic citizens. Particularly as we move into an infrastructural age driven by proprietary data sets and impenetrable algorithms and quantitative solutionism, we need an intellectual infrastructure that embodies the values of the commons: open and linked data, open and interoperable platforms, open pedagogies, open design practices, open doors, open access. Such intellectual resources – which, it’s important to remember, are also social resources – are just as critical to urban resilience and rejuvenation as are storm walls and bike lanes and artisanal enclaves. Detroit, like many other cities, has recognized the arts – both in their formal, institutional manifestations and in their organically-generated, fringe forms – as a key ingredient in its own renewal. The recent “Redesigning Detroit” competition, dedicated to imagining new possibilities for the old Hudson’s Department Store, predictably generated proposals for outdoor markets and concert venues, business incubators, and live-work facilities for high-tech start-ups and artists. Yet as plenty of precedents have demonstrated, “the Arts” occasionally alienate disenfranchised locals, spark gentrification, and lend themselves to appropriation and absorption into the official PR machine. Rather than advocating against the creation of infrastructures for creative and entrepreneurial development, I’m advocating for more integration across institutions and entities in what has come to be known as the GLAM sector: galleries, libraries, archives, and museums, all of which have the potential to serve as mutually reinforcing cultural and social infrastructures. Libraries and archives lend intellectual backing, informational resources, archival services, a commitment to public service, and an ethos of accessibility to more rarified cultural developments, and they serve as ideal venues for inclusive public forums and creative pedagogies: design workshops and public prototyping for the urban commons. Rarely do urban designers and developers put a library network at the center of their urban renewal proposals – but perhaps they should. Not only can the city’s disparate cultural and knowledge institutions serve as complementary social and intellectual infrastructures, but they can also work in tandem – drawing on their diverse collections and modes of address and engagement – to encourage experimental spatial pedagogies and promote infrastructural literacy as a public good. Detroit has a history of inclusive, critical approaches to spatial intelligence. The Detroit Geographical Expedition and Institute, directed from 1968 to 1972 by one-time Wayne State University professor William Bunge and local teenager Gwendolyn Warren, sought to map the spatial knoweldges of the marginal, to chart radical and socio-economic barriers, to capture the insights and develop the skills of the “folk geographer.” They détourned conventional cartographic practices to map not what was, but what ought to be, as a means of promoting social justice. Their diversity of surveying methodologies, mapping strategies and pedagogical approaches – from expeditions to free college courses – and the short lifespan of the experiment, reflect the challenges of comprehending and representing the infrastructures of injustice, or any complex, layered, over-determined urban infrastructure, for that matter. Despite a long history of critique surrounding the master-plan and conventional cartography and other institutionalized, naturalized modes of spatial representation, today’s designers, developers, civic officials, and corporate contractors continue to pursue the comprehensive data visualization, the exhaustive network diagram, the completist map, the “seamlessly integrated” urban dashboard – the ideal means of representing their version of infrastructural intelligence. Yet the “black stack” and similarly opaque and unmappable structures and systems often defy easy representation. Theorist Alex Galloway suggests that we simply have yet to create “adequate visualizations” of our network culture and control society and the infrastructures that undergird them. Or perhaps instead, representation itself is insufficient as a source of infrastructural intelligence. Architect John May proposes that pretty much all of our strategies for representing or mediating “infrastructural events,” including particularly their moments of failure, are suspect: “Real time” mass media; the practices of scenario modeling and accident investigation; the managerial discourses of prevention, monitoring and response; public relations and engineering bravado” — all, he says, ultimately “reify and reinforce the grand theater of modern functionalism.”  They suggest that the failures of containment, the leaks and glitches and inefficiencies, are the exception rather than the norm. “So many of our unfolding catastrophes” – and even the mundane operations of infrastructural systems, I’d add – “are simply not amenable to the kinds of spectacular productions to which we have grown accustomed,” May says. Nor do they lend themselves to the de rigueur data visualization, widgetization and “dashboard”-ification. May argues that the problem is scalar, both temporal and spatial: “the scale of their incidence renders them invisible to our methods of documentation”; invisibly small and slow phenomena accumulate over time into assemblages that are, “paradoxically, imperceptibly large.” Computationally-driven infrastructural operation, conversely, executes at a scale that is imperceptibly fast. These failures of representation may in part explain why many promoters of infrastructural intelligence resort not to representation, but to sensation, affect, process. They recognize that there is intelligence in experience and practice, even if we can’t always diagram, map, or model it. The limits of infrastructural representation may be among its most illuminating dimensions: our failures to sketch out its contours show how the systems we create, as they intermingle and reshape one another, often grow beyond our perception and conception, perhaps taking on agency and intelligence of their own. The same could be said of the infrastructures we create in our cities to cultivate knowledge: by offering libraries of resources and services, archives of documents and data, repertoires of learning sites and tools and strategies, our libraries and schools, exhibition spaces and labs together constitute an urban-scale scaffolding for illuminating experiences and practices. The infrastructural intelligence of this commons far exceeds anything we could presume to represent. “Jem Cohen: Hard Days at the Office,” The Reeler, July 5, 2015, accessed December 28, 2015, https://web.archive.org/web/20051127155611/http://blogs.indiewire.com/thereeler/archives/004886.html (via Wayback Machine). Benjamin Bratton, ‘The Black Stack,” e-flux 53 (March 2014): accessed December 28, 2015, http://www.e-flux.com/journal/the-black-stack/; Metahaven, Black Transparency: The Right to Know in the Age of Mass Surveillance (Berlin: Sternberg Press, 2014). See Karen Bakker, “Splintered Urbanisms: Water, Urban Infrastructure, and the Modern Social Imaginary,” in Urban Constellations, ed. Matthew Gandy (Berlin: Verlag GmbH 2011), 62-64; Rahul Mehrotra, “Negotiating the Static and Kinetic Cities: The Emergent Urbanism of Mumbai,” in Other Cities, Other Worlds: Urban Imaginaries in a Globalizing Age, ed. Andreas Huyssen (Durham: Duke University Press, 2008), 205-18; the Columbia University Graduate School of Architecture, Planning and Preservation’s now-defunct S.L.U.M. Lab. See Nigel Thrift, Non-Representational Theory: Space | Politics | Affect (New York: Routledge, 2008).